I-5_Passing Project, ©Robbins, Jetztzeit Studios, 2001-08. We live in the beginning of a “new” century in which the public sphere in California has shrunk, been compressed, and themed to the point of annihilation of any fixed point of authenticity. The current institutionalized regional development of the I-5 Freeway - the connective tissue between Los Angeles and San Francisco - is narrowing the bandwidth of cultural programming, social interaction and environmental concerns to that of lifestyle, market dynamics and branding. The next paradigm of social space, just now emerging, is a broadened spectrum ranging from the banal to the ecstatic – from contested visions of suburban utopia to suburban dystopia. We find ourselves now living in a “flat-space” where 20th century notions of living have taken on wholly different and contested meanings. Whereas “flat space” once evinced a topographical description of the central valley, it now references an intensified agglomeration of big box stores, highway infrastructure and parking lots in which space is corporate, Tyvek wrapped and hyperefficient. clusters, which dot the edges of quaint 20th century towns and clusters along I-5. The question soon becomes – where does one find oneself amidst the multi-channel, hermetically sealed, and wired living fueled by such an existence. This “ main street of California ” finds itself in a cultural moment hinged on the precipice of an unprecedented and dramatic upheaval. One could easily state that it is a moment which may become unrecognizable in the next…. a moment from which the future has been launched. This is a future that is strangely familiar but remains a work-in-progress. It is a future which houses residents alien to themselves – subjects on the run but stuck in traffic – seemingly going nowhere in particular – but not quite standing still. The strategy of the installation of I-5_Passing identifies fragile signs of regional cultural signifiers and changes within the environment and engages them as programmatic drivers. My aesthetic inquiry posits questions such as what lies beyond and between our collective overexposed, telematic imaginary? To me, there is little progress being gained in the current efforts of re-purposing re-theming, or refacading the topography. pollution levels such as Carbon Dioxide, NOX, Sulfur Dioxide, and Ozone which generates this live animation. 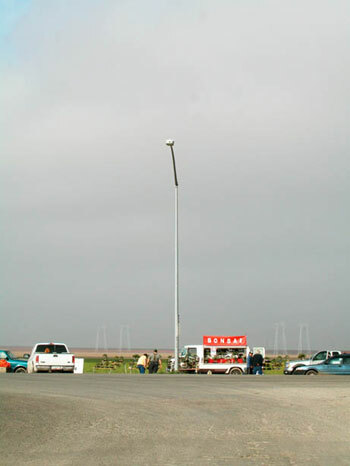 Sensors are placed periodically along the corridor of I-5 itself and levels transmitted wirelessly to the main server, which then serves as the primary distribution point. These levels are detected and transmitted hourly. In this landscape of extreme and rapid prototyping of (sub)urban development there is no whole, as such. Each behavior appears to be in aggressive competition or symbiotic relation to one another. I see evolution through re-thinking – rethinking our relationship to the swarming of hyperurbanism and psyco-geographic dynamics. The strategies inherent in I-5 _Passing (re)imagines a public realm of “passing “erupting out culture(s) of productive frictions … and fictions.